The World Youth Open Pairs Championships is the generalization of the World Youth Pairs Championships, inaugurated in Ghent, Belgium in 1995 and discontinued after the last edition held in 2006 in Piestany, Slovakia. 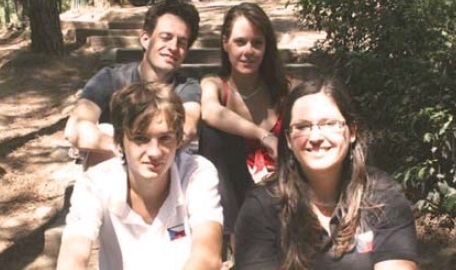 A new concept of youth competitions was inaugurated in 2009 and held biennally on odd-numbered years. The 1st edition, held at the Yedipete Campus in Istanbul, attracted participants from 29 countries. 1. 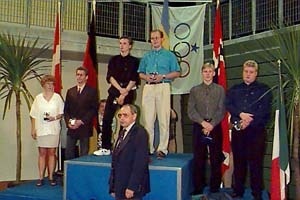 Mikael Rimstedt, Ola Rimstedt (Sweden). 2. 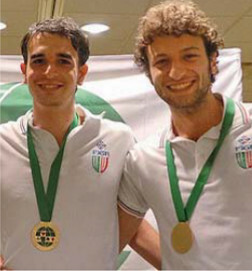 Rodrigo Garcia Da Rosa (Argentina), Giuseppe Delle Cave (Italy). 3. Sean Gannon, Julie Arbit (USA). 1. Massimiliano di Franco – Gabriele Zanasi (Italy). 2. Erkmen Aydogdu – Akin Koclar (Turkey). 3. Alex Prairie – Sylvia (USA). 1. Berend van den Bos – Joris van Lankveld (Netherlands). 2. Aymeric Lebatteux – Simon Poulat (France). 3. Marius Agica – Radu Nistor (Romania). 61 pairs took part in the Junior Pairs event. As it turned out the two leading players were playing against each other on the last round. Berend van den Bos and Joris van Lankveld from the Netherlands were 20.28 matchpoints ahead and they outscored Aymeric Lebatteux and Simon Poulat from France by 31.44 mps to 22.56 to take the world title. 1. Marion Michielsen – Tim Verbeek (the Netherlands). 2. Justyna Zmuda – Adam Krysa (Poland). 3. Aymeric Lebatteux – Nicolas L’Huissier (France). 94 Pairs entered this event, played over three qualifying sessions and four final sessions. 1. Magdalena Ticha – Frantisek Kralik (Czech Republic). 2. Antonio Borzì – Andrea Mortarotti (Italy). 3. Cédric Margot – Jérôme Amiguet (Switzerland). 36 pairs participated in this four-session event. For the first time in a World Championship event that was open to both sexes, we had a winning partnership of two women. Sara Sivelind and Cecilia Rimstedt of Sweden emerged victorious, but it was a close run thing! In a desperately exciting finish, three pairs entered the final round of four boards of the Junior event separated by less than a top. Two of the pairs who had slugged it out for three sessions at the top of the leaderboard were still there; Jacek Kalita and Krzysztof Kotorowicz, led Cecilia Rimstedt and Sara Sivelind but by only 10 matchpoints. Meanwhile the pair who had been in 12th place before the session started, Marion Michielsen and Vincent de Pagter had closed to within half a top of 2nd place, so any of these three pairs could have won with a good last round. The Swedes had edged in front with one board to go. On that deal with both sides vulnerable, the Swedes collected +600 in 5♣ for an average plus score, while the Dutch defended 3♠ doubled and collected 800 to close the gap on the chasing pairs. The Poles defended 3♥x, and should have taken 800, but a small slip allowed declarer to escape for -500, giving them a score of 71/140 on the deal, and leaving them second by just 36MP. Had they collected 800 the additional 54MP would have been enough for them to win. The Swedes’ winning margin was 36 points over the Poles, with the Dutch third, a further 35 points behind. The 5th World Junior Pairs Championship was a great success. It attracted 189 pairs from 27 countries (making the second best attended youth bridge event ever held), and stood out for the excellent organization and conditions provided by the Hunagrian Bridge Federation. The 5th World Junior Pairs Championship ended in suspence, with Adi Azizi and Yuval Yener of Israel capturing the world crown. 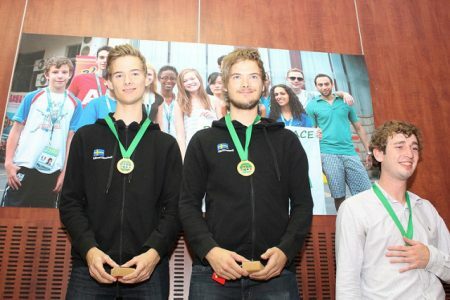 The winners were leading most of the way of the 4-session tournament, but at the end the Grenthe brothers from France put up a wonderful performance and came within a small fraction of a percent from winning. 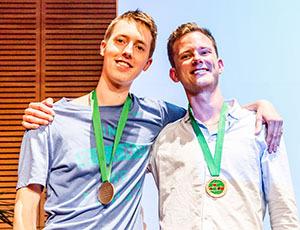 There moments of great anxiety as the results were being checked carefully, but at the end Guillaume and Jerome Grenthe took the silver medal. 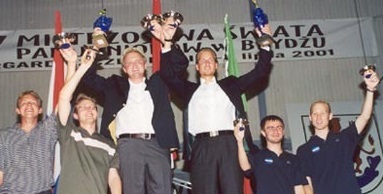 The third place was taken by veteran Junior Bas Drijver and his 16-year old brother Bob of the Netherlands. The 2nd World Junior Pairs Championship were held in Italy’s Sportilia Sports Academy. 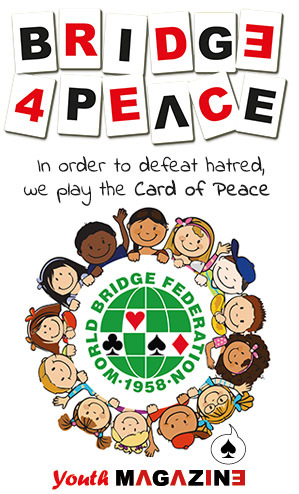 156 pairs from 27 countries and five geographical Zones of the World Bridge Federation took part. The Championship consisted of four 28-board sessions, played with the barometer system where real scores were available during play. There were no qualifying rounds, and all pairs met 56 different opponents in the course of the tournament.